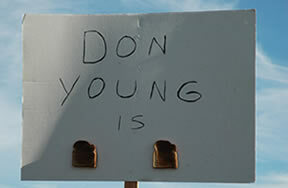 Democratic senator Barbara Boxer has had enough of Don Young and wants the Department of Justice to investigate a suspicious earmark he gave a Florida developer in exchange for $41,000. The earmark in question was a personally engineered $10 million insert by Young in exchange for a campaign contibution. Boxer's proposal is an alternative to one offered by Oklahoma senator Tom Coburn who wants a bipartisan panel of House and Senate members who have subpoena power. "I'm so angry about this, I'm so upset about this. I'm sick about this," Boxer said. "It's very possible people ought to go to jail here ... if there was a crime, then the person ought to go to jail or the people ought to go to jail. Let's get right to the point instead of setting up a political committee." "When there's a knock on the door from the Justice Department, you know it's serious and we'll get to the bottom of this," Boxer said. "Those people in the community asked for it"
Young's staff acknowledged yesterday that aides "corrected" the earmark just before it went to the White House for President Bush's signature, specifying that the money would go to a proposed highway interchange project on Interstate 75 near Naples, Fla. Young says the project was entirely worthy of an earmark and he welcomes any inquiry, a spokeswoman said. "There was an error in the bill and so it was corrected," she said.